One of the main issues some people have with the 52 week money challenge is the length of time it takes to save the money. That challenge is a year long commitment, and there are some who would rather focus on saving money in a shorter period of time. 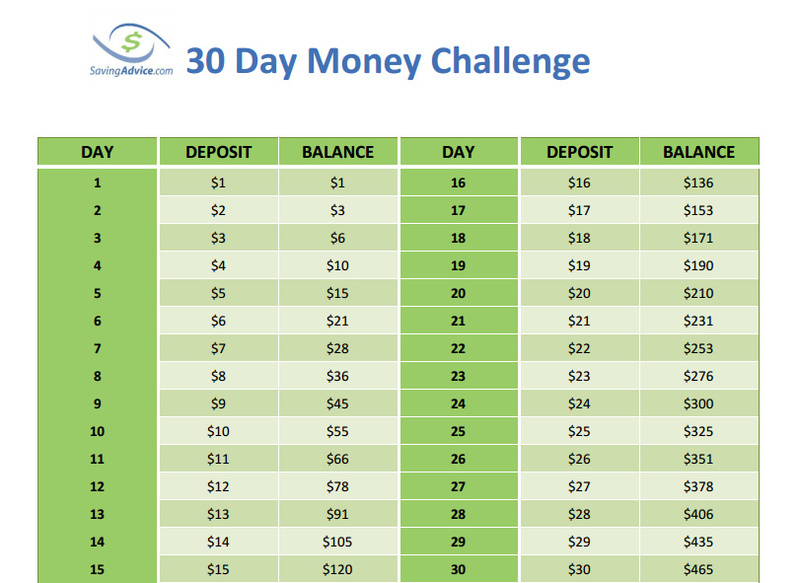 For those people, the 30 Day Money Challenge may be the perfect solution (click on the image above to print out the challenge). The challenge works in the same way as the 52 week money challenge, but instead of spreading out over 52 weeks, it’s done in a period of one month. On the first day you save $1, on day two you save $2 and on day three you save $3. You continue doing this on a daily basis until you reach day 30, when you save $30. By following this schedule, at the end of the month you’ll have saved $465. Even better, you will have established a solid savings habit that you can use to save even more money during the following months if you decide to. One of the big advantages of the 30 day money challenge over the 52 week money challenge and the 356 day money challenge is that you’ll learn where your savings “hurt point” is much more quickly. That is, when the amount you’re saving turns from being easy to being a struggle to save. While it may be easy to save $1 the first day, there is going to come a point during the 30 days when you realize saving a certain amount is difficult (or impossible). Finding out this hurt point quickly shouldn’t be seen as a failure of the challenge, but a great piece of information so that you can develop a challenge that works the best for you. While it could take months to find out the hurt point on the 52 week challenge, you’ll know what it is in less than a month with the 30 day money challenge. Another great aspect of the challenge is it doesn’t need to be done at the beginning of the year. You have 12 opportunities each year to begin as each new month gives you another chance to work at the challenge. You may want to do it 12 times in a row, or you may have certain months when you feel you have a better opportunity of completing the challenge. It gives you a bit more flexibility throughout the year to save during the times you’re most motivated. The shortened period of time also doesn’t make the challenge appear to last forever. Many people have trouble focusing on something for an entire year, while they don’t have as much of a problem remaining engaged for 30 days. While this isn’t true for everyone, those who like to focus on shorter periods of time may find this money saving challenge geared more toward the way they like to save money. The 30 Day Money Challenge is simply an alternative way to save money which will appeal to a certain group who want to begin saving. If it sounds like it would be a better fit than the other challenges out there, give it a go. As with all these challenges, the most important aspect is finding something that works for you so you can turn saving money into a lifetime habit. For those of you who feel this might be too ambitious to begin with, you can also try the 30 day quarter challenge which uses the same principle, and will net you just over $100 after 30 days. The past few years have been great for automated savings apps. A couple of good options you should check out are digit.co and acorns.com. Between the two, digit.co is certainly the most well known. This is because it is pretty much the ideal passive savings tool. You just create an account and let digit.co read your checking account’s transaction information. Digit will deduct a small amount – not enough to bounce any checks – and will sweep the results into an account you control. Pretty much all you need to do is sit back and watch the savings build up. Click here to learn more.